If you saw Finding Dory in theaters, you probably remember the adorable short that came before it. Piper is the story of a young sandpiper who just doesn't want to grow up. I really loved the short, and I wanted to share a few reasons why. 1. It's very well animated. I felt like I was at the beach. Everything went together so well. It was almost like I could smell the salt air and feel the sand. It was lovely. Also, look at those bubbles!! How do computers make this? 2. The story is relatable. 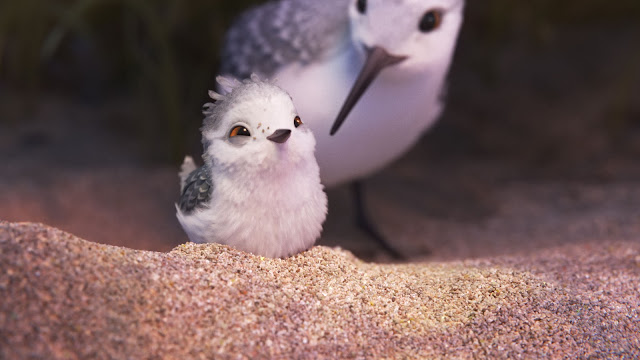 A lot of people right now feel like little birds pushed out of the nest to fend for themselves, especially all the young adults who were in the theater when this short was played. The short gives you hope, too. You might find some way you really like to do things, and when that happens, it's beautiful. 3. Piper is really cute. What is your favorite part about Piper?